WITH the coming into force of the Judicial Appointments Commission (Selection Process and Method of Appointment of Judges of the Superior Courts) Regulations 2009 on June 1, the Judicial Appointments Commission (JAC) should now be fully operational. The JAC, a legacy of former prime minister Tun Abdullah Ahmad Badawi, was set up by the Judicial Appointments Commission Act 2009 (Act 695), which came into force on Feb 2. 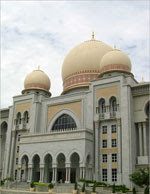 The main function of the JAC is to select suitably qualified persons who merit appointment as judges for the prime minister's consideration so that the prime minister, if he accepts any of the persons recommended by the JAC, may proceed to tender his advice to the Yang di-Pertuan Agong in accordance with Article 122B of the Federal Constitution, which provides that superior court judges are appointed by the king, acting on the advice of the prime minister, after consulting the Conference of Rulers. Only persons who are qualified under Article 123 of the Federal Constitution may apply for selection as a High Court judge. Such a person must be a citizen and, for the 10 years preceding his appointment, must have been an advocate of those courts, or any of them, or a member of the judicial and legal service of the federation or of a state, or sometimes one and sometimes another. In the case of a qualified person who is a serving judicial and legal service officer, the application has to be submitted through the head of department, who will forward the application to the JAC together with the relevant service information and a statement as to whether he supports the application or otherwise. (e) the CJ and PCA, for vacancy in the office of a Court of Appeal judge. However, the JAC may also consider names proposed by eminent persons who have knowledge of the legal profession or who have achieved distinction in the legal profession in respect of vacancies in the Federal Court and the Court of Appeal. - physical and mental health. A person who is a serving judge or judicial commissioner must not be appointed if he has three or more pending judgments or unwritten grounds of judgments that are overdue by 60 days or more from the date they are deemed to be due. In selecting candidates, the JAC must also take into account the need to encourage diversity in the range of legal expertise and knowledge in the judiciary. The applicants are then subjected to a screening process by the Malaysian Anti-Corruption Commission, Royal Malaysian Police, Companies JAC of Malaysia and Department of Insolvency Malaysia. Only the applications of those who have passed the screening process will be considered by the selection committee. In a selection meeting, the JAC shall select no fewer than three persons for each vacancy in the High Court and no fewer than two persons for each vacancy involving either the Federal Court or Court of Appeal judges. The chairman of JAC shall also be the chairman of the selection meeting but he may nominate a judge from among its members to chair a selection meeting when selecting persons as High Court judges. The quorum for every selection meeting shall be seven. Any vote taken at the selection meeting must be made by secret ballot and by majority decision. The decision of the JAC is final and conclusive. Therefore, it is an offence for any person who wilfully gives false or misleading information, or directly or indirectly in any manner whatsoever, attempts to influence any decision or member of the JAC. After making its selection, the JAC will submit the recommendation to the prime minister, which will contain the reasons for such selection and any other information which is necessary for his knowledge. The prime minister may, after receiving such a report, request for two more names to be selected and recommended for his consideration with respect to any vacancy to the office of the CJ, PCA, CJM, CJSS, Federal Court and Court of Appeal judges. In this respect, the JAC has to ensure that reserve candidates are available in order to comply with the prime minister's request. Meanwhile, judges' salaries and perks have also been revised upwards and backdated to Jan 1 when the prime minister signed the Judges, Remuneration (Amendment of First, Second and Fifth Schedules) Regulations 2009 on May 18. - High Court judge -- RM17,754.76 (RM 13,054.97). There is also a corresponding increase in the monetary value of the perks. With that, it is hoped that more qualified aspirants will be encouraged to apply, especially those from the legal profession, but only time will tell whether all the above will bring about a more independent and transparent selection process in the appointment and promotion of judges.